Whether your child wants a ninja costume for Halloween or for a costume party--or just for daily playtime--you have a number of great options. Ninja costumes are a great idea for adults, too, as they are simple and can often be "pulled together" at the last minute from items that people usually have on hand. Historically, the ninja were a group of people trained in stealthy maneuvers. They practised a form of movement/martial arts known as ninjutsu, and were originally a defensive force of the commoners against the elite samurai. Ninja were often hired to assassinate, kidnap, and spy on enemies. The usual basic ninja costume consists of black everything: black pants, black top, black sash, black socks and shoes, black gloves, black mask, and some sort of weapon. The closer-fitting the clothing can be, the better. The fabric should be light and not bulky, and the wearer should have plenty of freedom to move. Historically, however, a ninja might have worn the same types of clothing as the common people, as the all-black garb would have called attention to itself in an era where kimono and other traditional Japanese clothing were colourful and usually intricately patterned. The all-black motif seems to have come from Kabuki theatre performances, and has been promulgated by film, comic books, and art. There are a number of different things that you may choose as weapons for a ninja costume: samurai swords (one short, one long), matched daggers, throwing stars, nun-chucks, a garrotte. Many toy stores and costume shops carry matched sets of weapons, and some of these sets also include gloves, mask, and sash. The weapons can be thrust into the sash or carried in the hands. Ninja costumes are quite popular, and most costume suppliers will have several different styles to choose from. There are some ready-made ninja costumes that have padded breastplates similar to samurai armour, others that are red or that are emblazoned with various insignia such as dragons or Oriental characters. The most prevalent, however, are the all-black ensembles. 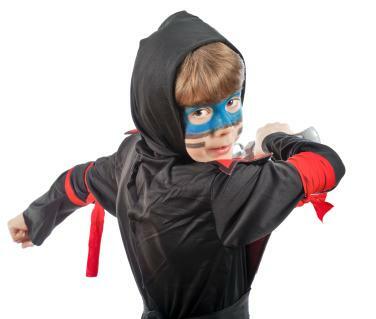 The easiest foundation for your home-made ninja costume is black sweatpants and a long-sleeved black T-shirt or sweatshirt. If you do not have sweats, any tapered black pants and long-sleeved black shirt will do. Black socks and black shoes are a must. Black house-slippers or "slipper socks" work well. For a mask, you can use either black scarves, a black balaclava, or a black T-shirt. Put the neck-hole of the T-shirt across your face with the front of the shirt hanging down around your neck and the back of the shirt going over the top of your head, then tie the sleeves behind your head. For the sash, any long piece of black cloth will do; simply pass it around your waist several times, then tie it off with a simple knot. You can push your swords and daggers through the folds of the sash to hold them in place. Black gloves are a nice touch. One simple way to get a more authentic look is to use black "tabi"--the Japanese-style sock with the separate toe for the big toe. Tabi make the foot more flexible for climbing, gripping rope, etc. You can buy tabi socks from a few costumers, but it's also quite easy to make your own. You'll need black socks that are slightly larger than your usual size. Mark where the division between your great toe and your second toe should be made. With strong black thread, make a double seam along the dividing line, taking a few horizontal stitches at the place where the toe joins the foot to strengthen the seam.